Harmful organisms do not start and stop at the foot of a bed. Pathogens proliferate throughout facilities via complex and patterned transmission networks. 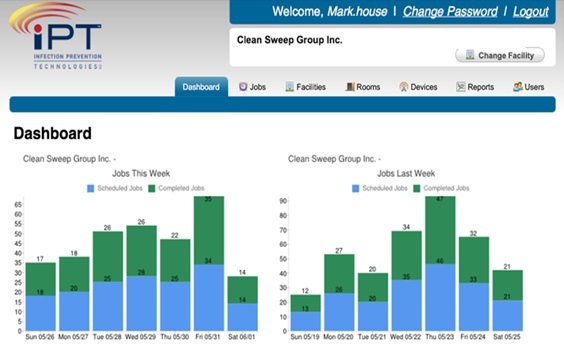 Clean Sweep Group, Inc. delivers regular assessment reports to ensure quality of service over time. CSGI’s unique service model incorporates the IRiS™ 3200m’s Steri-Trak™, a web based data tracking, scheduling program that ensures our team meets your compliance requirements. Steri-Trak™ allows customers to track their account activity online and in real time, 24 hours a day, seven days a week. Details of all disinfection treatments are available electronically through any web-enabled device. Our proprietary step-by-step process has been proven in clinical settings and adapted for use in many other facilities, including schools, cruise ships, sports centers, restaurants, kitchens, hotels, homes and more.